io9 is proud to present fiction from Lightspeed Magazine. 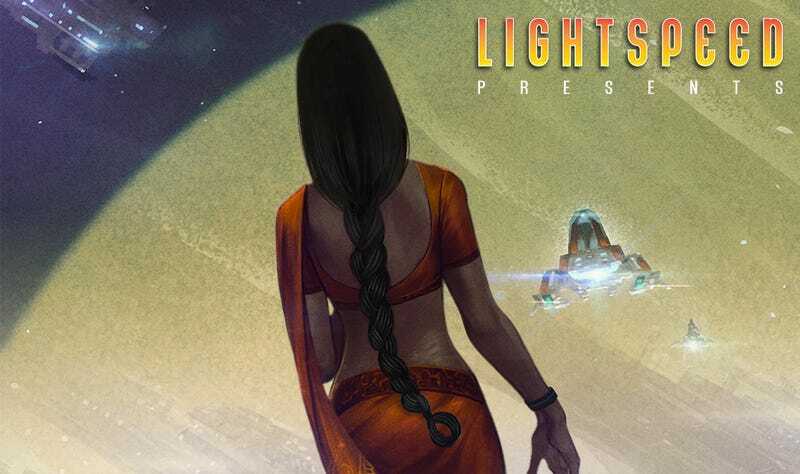 Once a month, we feature a story from Lightspeed’s current issue, and this month’s selection is “Tongue” by Ashok K. Banker. You can read the story below or you can listen to the podcast. Finally, new Claims open. I call Him. He comes soon as possible—-after wrapping up hunting trip and saying bye to Sondra—-and goes to work again. Ashok K. Banker is the pioneer of the speculative fiction genre in India. His ground-breaking internationally acclaimed eight-book Ramayana Series was the first trilogy and series ever published in India. It revolutionized Indian publishing, creating a genre which is now the biggest selling in the country. Ashok’s 52 books have all been bestsellers in India, as well as translated into 18 languages and sold in 58 countries. He has also been credited as the author of the first Indian science fiction, fantasy, horror, crime, and thriller stories and novels in English, creator and screenwriter of the first Indian TV series in English, the first Indian ebooks in English and other firsts. He is one of only a handful of living Indian authors represented in The Picador Book of New Indian Writing and the Vintage Anthology of Modern Indian Literature. Two new novels are due out in 2018: Upon a Burning Throne (John Joseph Adams Books) and Rise as One (Delacorte). He is of Irish-Portuguese-Sri Lankan-Indian parentage. Born in Mumbai where he lived for 51 years, he now lives in Los Angeles. Please visit Lightspeed Magazine to read more great science fiction and fantasy. This story first appeared in the August 2017 issue, which features eight science fiction and fantasy short stories, plus a novella, nonfiction, and novel excerpts. This issue also contains work by Maurice Broaddus, Ken Scholes, Susan Palwick, Seanan McGuire, Carrie Vaughn, Bruce McAllister, and more. You can wait for most of this month’s contents to be serialized online, or you can buy the whole issue right now in convenient ebook format for just $3.99, or subscribe to the ebook edition at a discounted rate via the link below.